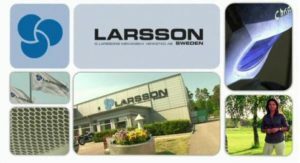 LARSSON was founded in 1948 and is today a leading manufacturer of process equipment for the starch industry. LARSSON has built up a substantial bank of expertise that covers the entire starch process in different adaptations for several starch sources. LARSSON patents and LARSSON machines, equipment and expertise have opened the doors to an expansive export all over the world. Our manufacturing plant is located together with our head office in Bromölla in southern Sweden. LARSSON has since august 2007 a trading company, located in Guangzhou and since 2009 a Rep. Office in Belarus, located in Minsk. Since 2015 do LARSSON also have a company in Brazil. Through a network of specialized sub-contractors and partners in different areas, LARSSON offers efficient solutions and extensive delivery capacity. LARSSON is an independent company, wholly-owned by the Larsson family. The actual processes were also developed and it was Gösta who led this work, with his position becoming more consolidated both in Sweden and the rest of Scandinavia. It became more and more difficult for their competitors. “We had got off to a good start. Our products were more developed and adapted and today as is well known we are a world leader and we don’t intend to relinquish this position,” says Gösta.